The Red Chair Blog: Copy Cat: Look-Alikes For Less...and the Giveaway Winner! Copy Cat: Look-Alikes For Less...and the Giveaway Winner! My husband recently pointed out to me that--although he likes the concept of my Copy Cat posts--I have a tendency to pick on Pottery Barn when I feature look-alike products. I had to admit that he had a valid point, so I will do my very best to pick on other retailers in the future. 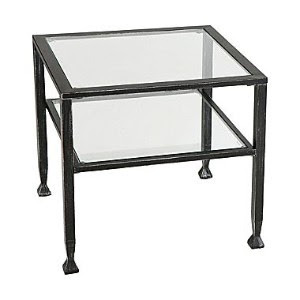 She spotted the Tanner Cube table at Pottery Barn for $249 (left photo), while the JC Penney Metal and Glass Bunching Table is currently on sale for $119 (right photo). After purchasing her tables from Penney's, she reported that the tables looked great and she felt that they looked exactly like their Pottery Barn equivalent. If the photos are any indication, I'd have to agree! 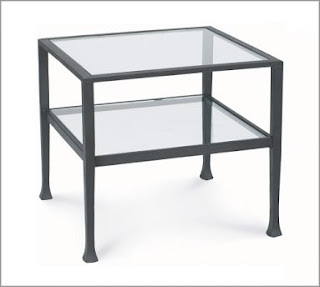 Glass tables like these are great for small spaces; they provide the functionality of a table without taking up too much visual space. On another note, I'm excited to announce the winner of the Prairie Storms Prints Giveaway. The winner, picked by Random.org, is Michele P., whose comment read, "I like the Dancing Fools Step One... the vibrant colors and energy in this piece is amazing!" Congratulations, Michele! I will contact you via email to get your mailing address. Thanks to all who entered! This post has been linked to Finding Fabulous. Stop over to see lots of frugal finds!